By the end of World War II, Silvana is a ghost of the wife Janusz once had. She and their 7-year-old son Aurek travel from Poland to England to reunite their family--a family that has been separated for 6 years. 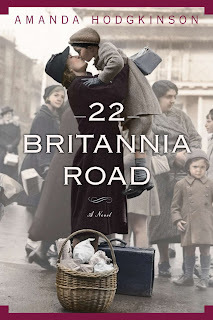 That's where 22 Britannia Road, Amanda Hodgkinson's stunning debut novel, begins. As the past unfolds from multiple points of view, it becomes clear that despite their determination to make a fresh start, the hidden secrets of the past threaten to destroy Silvana and Janusz's dreams of becoming a family once again. The irreversible events that passed during their years of separation still linger, including the horrors of war, Janusz's betrayal by a love affair with another woman, and the devastating secret that Silvana will do anything to conceal. On the ship to England, Silvana is asked if she's a housekeeper or housewife. Why does this question jar her? Aurek thinks of Janusz as "the enemy." How do his feelings change over the course of the book, and why? Hodgkinson toggles back and forth from the past to the present in this novel. How does telling the story in this particular way affect the experience for the reader? Could she have told it in any other way? Janusz longs for an English life. What are some of the things he does to try to adapt and assimilate to his new homeland? The relationship between Silvana and Janusz and their English neighbors Doris and Gilbert is complicated. Do you believe they are genuinely friends? Silvana is obsessed with discarded clothes and photographs of children. What do these objects represent for her, and how do they comfort or help her? What is it that draws Silvana to Tony? How does her relationship with Tony differ from her relationship with Janusz? When he learns the truth about Silvana, Janusz tears up his English garden and begins planting trees. What does this act accomplish for him? Almost everyone in this novel has a secret—is there any instance in which keeping the secret might have been better in the end? Are secrets always destructive in relationships? In the final third of the book, there's a shocking revelation about Silvana's past. How did you react to this development? How did it make you feel about her as a character?